The ASR33 is a printing terminal and a program storage device (paper tape) used with PDP-8 systems. 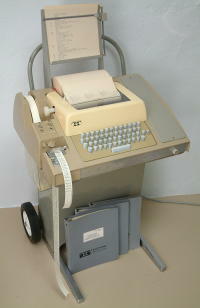 This model of Teletype terminal was made from about 1965 to 1976. They were quite common on earlier machines or minimally configured machines. The ASR 33 uses rolls of paper on which it prints 72 characters at 10 characters per inch. The ASR 33 teletype can print 64 characters which only allowed for UPPER CASE LETTERS, numbers, and symbols. The paper tape reader and punch can handle 8 bit binary data. The tape punch uses 1" wide oiled paper tape rolls. Oil is added to the paper to lubricate the punch. The communication to the host computer uses 20 mA current loop. The early PDP-8 serial interfaces only supported current loop. In the 8/E timeframe the serial interfaces supported both current loop and RS-232 which uses voltage levels for sending data. The last PDP-8's only supported RS-232. The ASR 33 transfers data at 10 characters per second, 110 baud. This isn't too bad for interactive use but is slow for printing large listings or loading large programs. It would take close to 7 minutes to load 2000 words of the PDP-8 memory from the paper tape. That made the high speed reader/punch or a disk drive popular options. The ASR 33 was derived from the Teletype corporation Baudot terminals which were used for telecommunications, newswire reports, and radio teletype. The Baudot units used 5 bit codes. The ASR 33 used 8 bit codes to be compatible with computers although it is upper case only. During this time computers were standardizing on multiples of 8 bits for the word size. The PDP-8 with its 12 bit word was the end of the earlier era when many different word sizes were used. The ASR 33 has very little electronics. The keyboard, printing, and reader/punch encode and decode the serial data electromechanically. Early electronics were expensive so were used sparingly. The first Teletypes were made in 1902, well before the transistor was invented in 1947. Since it is mechanical it requires periodic maintenance. The manual calls out about 500 spots to oil or grease plus many adjustment points. The one shown in these pictures mainly needed oiling. This type of printing terminal was made obsolete by faster dot matrix printing terminals such as the DECwriter II more DECwriter II and CRT terminals such as the DEC VT family VT52 and VT100 more VT100. The teletype was quite noisy during operation, loud enough to need to speak up to be clearly heard when talking while it was printing. The videos below will let you see and hear what it was like using one. The unit in most of the pictures was made in about 1972 and the older one about 1970. In 1974 the ASR 33 teletype sold for $755 to $1220 depending on options. teletypeparts@aol.com has parts for ASR 32 and 33 Teletypes and also does restoration of them. Power less than 4 amps at 115V 60Hz.